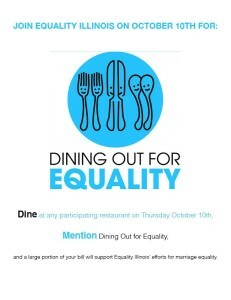 Dining Out for Equality is back on Thursday, October 10th! This is our fifth anniversary of the growing event that allows you to enjoy a great meal all while supporting a great cause. Dine and/or drink at any of our participating restaurants and a significant portion of your bill will be donated to Equality Illinois to support our LGBT rights and marriage equality work across the state. Be sure to mention Dining Out for Equality when you make your reservation or sit at your table! Click here for the updated list of restaurants.